1959—a time when the world was poised on the brink of an explosive new decade, a decade which would see scientific experimentation and knowledge expanding at such a phenominal rate that before it was over man would set foot on the moon, an age of political turbluence which would forever transform the “baby boom” generation as the “cold” war came frighteningly close to becoming an all-too-final “hot” war. 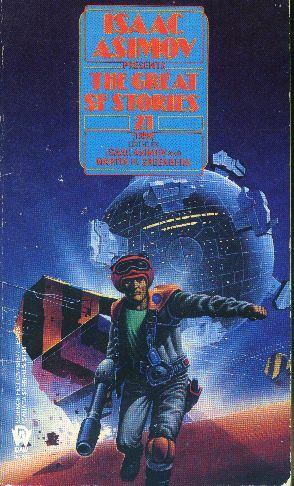 For general comments on this series, see Isaac Asimov Presents the Great SF Stories 1, 1939. There is no Asimov here, and this isn’t entirely surprising. Asimov published only five sf stories in 1959: “A Statue For Father,” “Anniversary,” “Unto the Fourth Generation,” “Obituary,” and “Rain, Rain, Go Away.” The first and last of these are rather poor, and the middle three aren’t quite good enough for inclusion in an anthology like this. There is, however, also Philip José Farmer’s “The Alley Man”—and I can’t stand that story! Nothing against Farmer as a writer, but I really, really loathe “The Alley Man,” and its presence in any anthology pulls the anthology down for me, as in this case. This book, by the way, has an unusual problem: There’s a typo on the spine, and the volume number is missing. The spine identifies it simply as “The Great S.F. Stories:,” complete with colon but sans number.